Parascending and hang gliding are seen as the adventurous way to take to the air!There is a minimum age requirement of 14 for paragliding and parascending. For hang gliding pilots need to be 16 or over. Anyone flying under the age of 18 will need parental or guardian's consent. No previous flying experience is required and there are perhaps surprisingly, no medical requirements. Common sense dictates that pilots should be fit, have good co-ordination and a level of intelligence that will keep them out of danger. One of the key considerations for this branch of flying is clothing. Layers of light, warm clothing are better than thick garments, which may restrict movement. All in one ski suits are very popular as they allow freedom of movement whilst keeping out the chill. Even on the warmest of sunny days it is cold when airborne with wind chill factors to take into consideration. Some pilots hate gloves, others swear by them so it seems they are very much a personal choice. If gloves are worn they need to have non-slip grips in order that the pilot can handle the controls. The pilot's feet are the landing gear so robust footwear, that offers good ankle support, is required. All the better if these are waterproof as landing sites can often be boggy. When parascending, pilots fly parachute like canopies that are winch or vehicle towed into the air before gliding back down to land. The first aspect to be learned about flying these canopies is how to land safely. A parachute landing fall technique is taught to ensure the pilot can land injury free. First flights take place whilst remaining attached to the tow vehicle and these first flights are controlled by the vehicle driver and not the novice parascender. Flights last for just a few moments and are undertaken primarily to practice the landing technique.Once the instructor is sure the student can land safely, solo unattached flights will be possible. Advanced techniques will be taught that include turning and precision landing. The square canopies offer more possibilities and most students progress to these having started their training on a round canopy. With a square canopy full circuits are flown. To qualify for a parascending rating, students must take an exam, which covers theory of flight, meteorology and air law. Having learned to parascend some pilots progress to paragliders, which use the long elliptical shaped canopies. 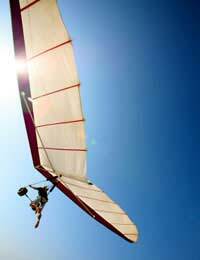 Hang gliding makes use of a simple aluminium or carbon-fibre frame that supports a sail fabric. The pilot is suspended beneath the wing of the hang glider by a secure harness. Take-off is achieved by hurling man and machine from the top of a hill that faces into wind. Tow launches behind a microlight are also possible. The challenge with hang gliding is to locate the uplifts, the currents of air that will keep the hang glider aloft for as long as possible. Astonishing records have been set for cross-country flights in these flying devices. A hang glider is more challenging to fly than a paraglider but it is more robust and can be flown in stronger wind conditions. Control is achieved by weight shift and it is easy to see how the original microlights developed from the sport of hang gliding. Instruction to become a hang glider pilot involves learning how to assemble the rig and make the necessary safety inspections before flight. First flights usually take place close to the ground and attached to a winch. Club pilot ratings are awarded when proficiency is demonstrated and the ground exam passed. For those who have adventure in their soul, hang gliding and parascending represent a chance to fly without having to worry about engines and passengers. Just man or woman and the sky - some would say it is flying in its purest sense.